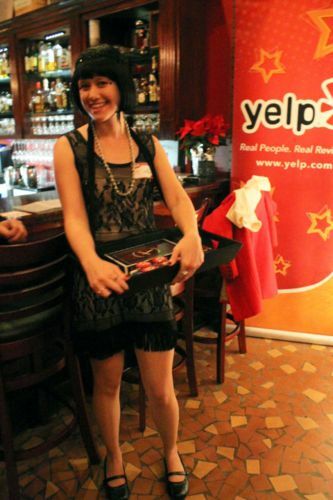 On occasion, I get the pleasure of an invitation to the swanky, fun, creative parties put on for Yelp Elite members. 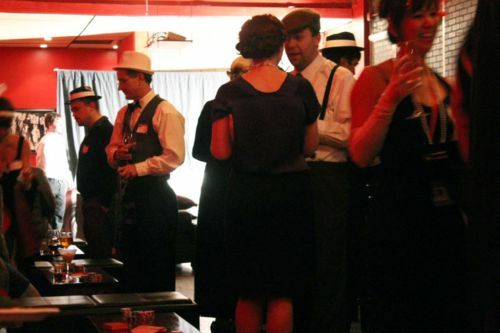 Last Sunday night was one of those occasions, and the theme was mobsters and molls. That theme happens to fit the venue, a few-month-old club in Durham called the Roxy, to a tee. 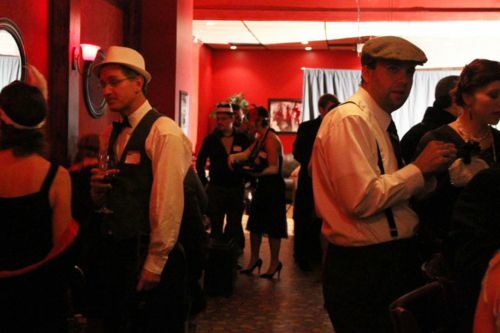 The Roxy, you see, is meant to evoke the spirit of those speakeasy days when you never knew whose bathtub the moonshine was coming out of. 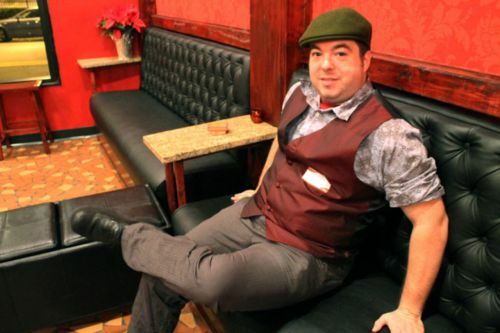 Not being restricted to illegal alcohol these days, of course, the Roxy focuses on classic cocktails that got their start around the turn of the century. These sorts of cocktails, like sazeracs and Manhattans, just happen to be my favorite kind. I was just as excited to try the Roxy’s holiday drinks launching at this party as I was to realize that my little red dress is a few sizes too big these days. 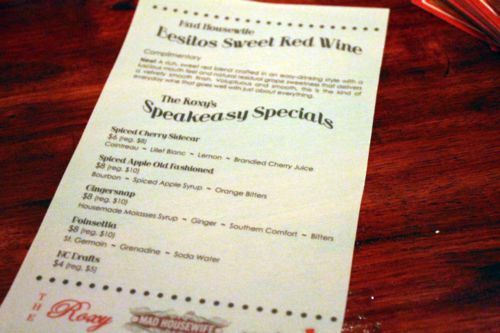 Ever the devoted drink blogger, I managed to make my way through three of those options, starting with the Spiced Cherry Sidecar ($8). 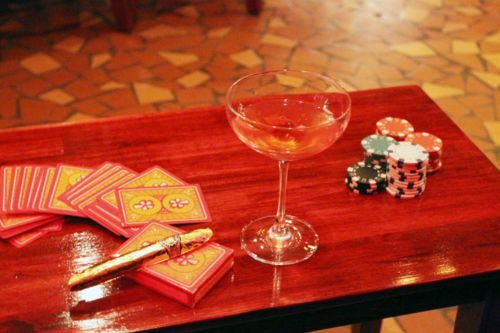 The drink amidst the Yelp wares of the evening: playing cards, poker chips, and chocolate cigars. The Spiced Cherry Sidecar is made with Cointreau, Lillet Blanc, lemon juice, and brandied cherry juice. You can’t see them well in this picture, but there were several brandied cherries resting at the bottom of the glass, and I adore brandied cherries—black forest cake is my absolute favorite dessert—so it’s no wonder that I loved this drink. The level of alcohol hovers between smooth and strong on the palate, and the subtle Christmas spices give it a beautiful sophistication. The only drink I liked more was my second, the Spiced Apple Old Fashioned ($10). Yes, it’s a pricy drink, but I thought it was worth every penny. I’m not sure what bourbon they use, but it goes beautifully with the spiced apple syrup and the orange bitters. 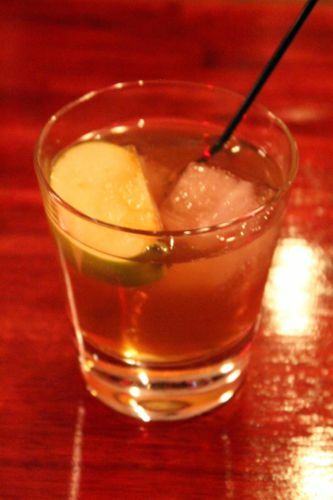 This is a strong drink, but with those warming spices and the comforting taste of apple, I don’t think you’ll mind it. I certainly didn’t, and I am definitely going to have another one sometime soon. 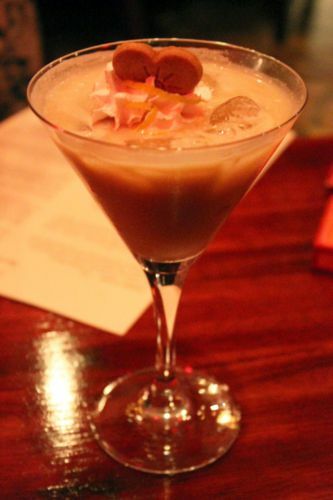 My last drink, the Gingersnap ($10), didn’t measure up in comparison. Made with molasses syrup, ginger, bitters, and grenadine, it was too similar to a dessert cocktail for my mood that evening. But that doesn’t mean it’s not delicious—oh contraire, my friends. First of all, I think that beautiful little heart-shaped gingersnap on top and the whipped cream with it make the drink by calling to mind the cookie flavors so you can appreciate how the unusual ingredient list manages to give a pretty close approximation of one. If you have a sweet tooth, try it. Thoroughly impressed with the Roxy’s drink options and atmosphere, what was a sauced young moll to do but take some more pictures? It doesn’t require much concentration. 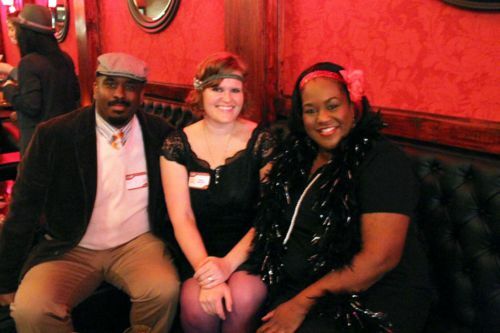 Take a gander at these swanky yelpers. 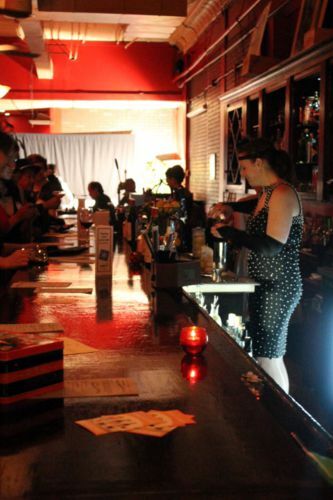 A little behind the bar action—and how awesome is it that the Roxy’s bartenders and owner dressed up? 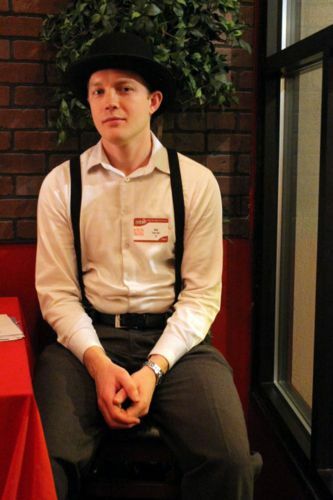 And to end, another shot of my husband, looking smashing in his 1920s gear. 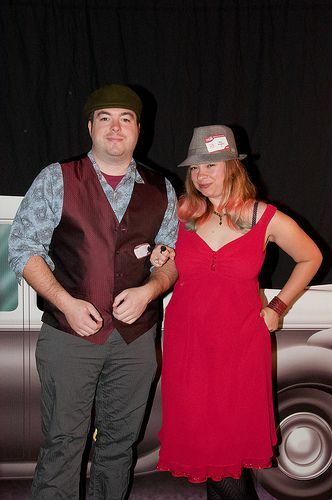 He claimed that the clothes were horribly unauthentic, but hey, it’s a party and he was cute, so I think he deserves the final shot anyway. 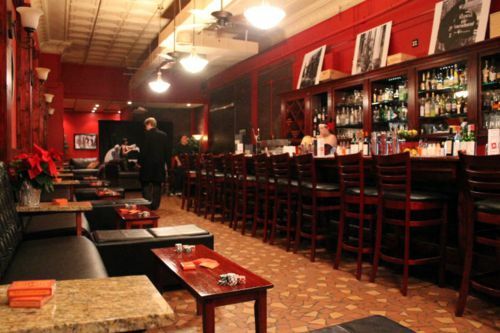 You should definitely head out to the Roxy if you like classic cocktails recipes and enjoy the allure of dark woods, warm red walls, and friendly bartenders. Just don’t forget to bring me along.